The Hasties, Tarah and her husband Adam, are among Hume’s newest fans! 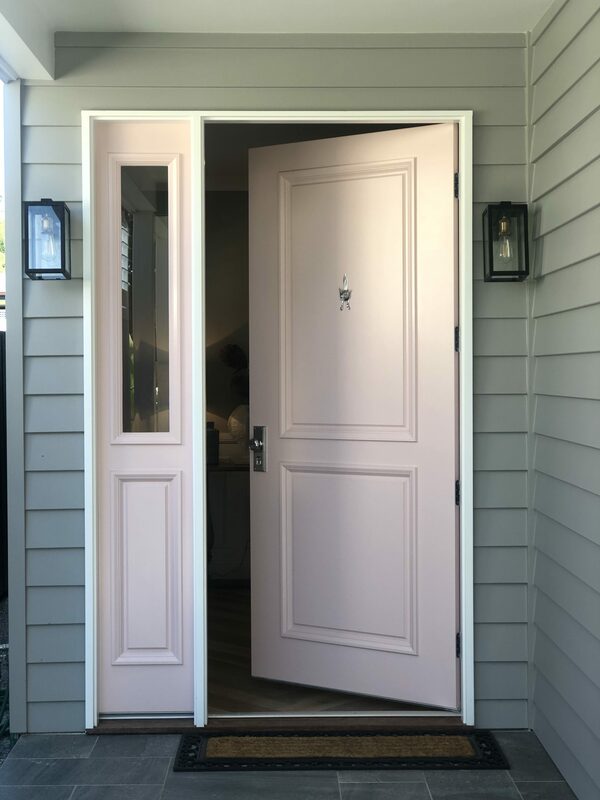 Having only discovered Hume Doors & Timber recently, the couple say they’re glad they made the change and won’t be looking back. A tag on one of @hastiehouse’s Instagram posts led us to chatting with Tarah about the building duo’s latest projects. They’ve been working in construction for quite some time, creating and selling homes. Tarah estimated the pair get through between five and eight homes annually – that’s a lot of doors, so you need to be sure you’re happy with the products you’re receiving! Being familiar with the construction industry, Tarah and Adam knew they weren’t getting the best bang for their buck with a competitor supplier and felt as if they’d exhausted the brand’s limited product variety. They agreed it was time to reconsider (and we’re glad they did!). It was during one of their recent renovations in the northern Brisbane suburb of Kedron, QLD, that they decided to switch product suppliers. Tarah said it was time to change to a supplier that would allow more flexibility and recommend products that worked for them. Three stand-alone homes were built side by side. “We created a similar traditional feel for the new homes that replaced the colonial style that once sat on the block,” Tarah told Hume. They wanted the design to fit in with the surrounding traditional homes of the area, thus choosing a specific style for the homes’ fixtures. The couples’ current project, in neighbouring suburb Ashgrove, is another split block featuring two brand new homes. Taking on a project this big, with five bedrooms and four bathrooms between the two storey homes, meant using names you can trust. Tarah and Adam went straight back to Langs and Hume. The Ashgrove project marks the fourth and fifth builds that the couple used Hume Doors for. “We wanted the home to look chic and inviting, but we needed to use products that weren’t going to break the bank,” Tarah recalled. Inside, they used HAM1 from our Hamptons internal range which appealed to their preferred style; traditional. They complemented the simple, but elegant design of the Hamptons products by picking Smartrobes for their cupboard and wardrobes. The coastal calm was transformed to city-trend with a glossy coat of white paint. “They look quite high-end now and you’d never know that they came in under budget,” Tarah said. The front and side doors from our entrance range were selected from the Vaucluse Premier options. The front door is an XVP11 (in 2340 x 1020) and features the XVP13 (2340 x 400) side light. The side entrance followed a similar theme, with the XVP20 (in 2340 x 1020) main door and a XVP13 (in 2340 x 400) side light. 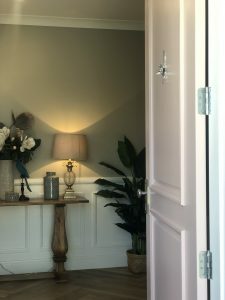 “While these products are quite traditional, we’ve made it more our style in prior builds with black, white and pink paint colours,” Tarah said. This particular entryway was coated gloss black and jazzed up with a traditional door knob set in polished chrome. “The front door detail with side light is something that we feel creates a beautiful first impression for the home. The products are definitely a good option for us as they appear more traditional and offer options featuring intricate details,” Tarah explained. Tarah and Adam wanted to achieve that “weatherboard” traditional look but hated the thought of the excessive maintenance that often comes with it, so they opted for our PinetrimXT instead. After researching the product and understanding exactly what it is, they found it to be the perfect fit for them – the product is low maintenance and fits with their style. For more information on Hume, get in touch with our friendly team today! Or to purchase your own Hume Doors, check out any of our great distributors.